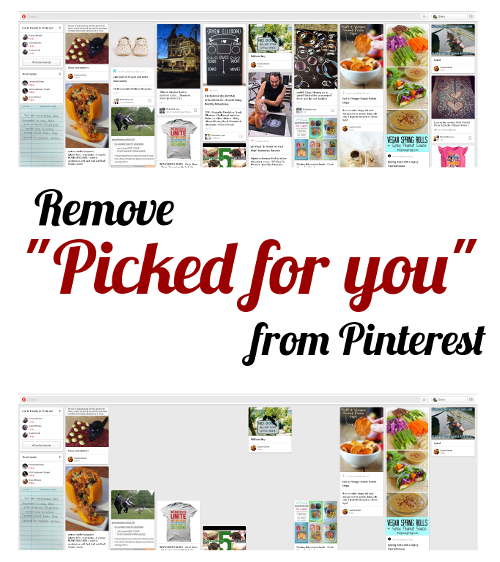 Remove "Picked for you" pins from Pinterest. Update: Pinterest now lets you disable Picked For You pins! Go to your profile, then press the settings button (a hexagonal bolt). Scroll down to "Home feed", then switch 'Show "Picked for you" Pins in your home feed' to 'No'. Thank you all for your kind comments and bug fixing for this script. I hope it was useful. It's no secret that I love Pinterest more than is really okay. They've started doing this thing where they show you "Picked for you" pins on your homepage, interspersed with your friends' pins. I quite like the curated pins they choose, but sometimes I like to just see what my friends have been up to. You have the option to go through and deselect all of your boards, which I assume would prevent you from getting "Picked for you" pins at all. However, I wanted something a little less permanent, so I've made a bookmarklet. Then, if you go to pinterest.com and click on your new bookmark, the "Picked for you" and "Promoted by" pins will have disappeared. Next, click on the Greasemonkey icon in your browser (usually in the top right), go to "New User Script", then "Use Script From Clipboard". Now, when you go to Pinterest and click on the Greasemonkey icon again, there should be the option "Remove Picked For You". If you tick it, you'll see that the pins disappear. For Google Chrome, there's an extension called Tampermonkey, which works in the same way. If the script or bookmark aren't working for you, try reinstalling them from this page, as I might have updated the code. If this doesn't fix it, tell me in the comments. The latest code is always available on Github. Do you have a menu option at the top that says "Develop"? Okay, to get this menu, open Safari > Preferences, and click on the Advanced Tab. At the bottom of the pane, check the box next to “Show Develop Menu in menu bar”. Then you should be able to go to Develop > Show Error Console. Also, try reinstalling the script, as I've made an update. I've had a tinker and I think I've fixed the 'Promoted by' problem - try reinstalling and let me know if it works. Yay! It works. Thank you so much for all your hard work Beth! Pinterest is really annoying. For about a month they did better. Now they went back to their old ways. I really should have told them thanks for reducing it but alas, bad on me. It started again with a vengeance and I tried my bookmarklet. It didn't work. I came here again and re-added it, works great. I just wanted to thank you for that. You're a goddess for doing it and sharing! No longer working for me in Chrome, Windows 10. So many ads now! And all things I'm not the least bit in to. Thanks, it's working again!! You are a Master Tweaker. I appreciate it!! is there a way to put it on your phone? it's getting so annoying! I find myself using my phone and iPad often for Pinterest but will no longer be going to their feed because of all their 'chosen for me' pins rather than MY chosen ones. On my iMac, the 'Remove Picked for You' works but have to do it often since it only apparently works for one full page, as I scroll down I have to click on it again and again. My estimate is that 50% of the pins are THEIR chosen ones. So maddening. What does Pinterest NOT understand about pinners wanting to see pins from people they're following, NOT Pinterest's choices. THANK YOU! I've been so annoyed by all the picked For you Pins lately. Your bookmark script worked amazingly well! I am SO EXCITED to have found remove PFYP. I use Internet Explorer 11. Will remove "Picked for you pins" work with it? I am not quite sure or how to install & use it. I am looking forward to your help/reply! BTW how many picked for you pins are removed each time you use remove PFYP? My home feed is overwhelmed by them. Oops! Missed off a couple of semi-colons there. Copy the script from the post again and it should work just fine. This is unbelievably easy to use (but probably super complicated in reality)! Thanks so much! Pintereste must have upgraded again. Now it seems to take away the "picked for you" but changes the "promoted by" to just empty white squares. ** Do you also have one to remove "Related Pins" from the pages where you work on your own pics? That is so much better! Thank you. Thank you for creating/perfecting/updating the "Remove Picked For You" script. What a relief! But Pinterest has now started forcing what they're calling "Inspired By... " pins on us. They're described as being inspired by our pins on our various boards. "Inspired by [put the name of one of your boards here]". Please update the script to address this latest intrusion? Thank you in advance. Are going to update Tampermonkey? - I've started getting "promoted bu" pins again. Pinterest has far fewer 'picked for you' but now they have 'Ideas for You' .......... do you happen to have a fix for those? There are less of them, but I do NOT want THEIR ideas. I just checked and it look like we can opt out of the Pick for you in home feeds now. I have watched it but today so not sure if it works well. Would still love to get rid of the promoted pins. Now they've added 'ideas for you' - why do I even bother with pinterest. Beth, I do think they are still providing picked for you but not labeling it. Right now we have no more home feed button. When I look thru the general feed area without selecting one specific one I assume that is now my home feed? I have selected No for picked for me but I still think they are doing it without labeling it when I look at my big general feed. I do think promoted pins could also be considered picked for you as well. No button to remove those. That big feed is full of stuff I am not interested in and not following. I don't even see the point of following anyone since my feeds are full of crap I am not interested in like Austrian castles, owl crafts and strange nail polish. I don't put in a gender and get tons of female everything. I thought that might help reduce all the stuff I am not interested in but not even that helped. So if you don't put a gender I guess they default to women's stuff. I have tons of food pins with stuff I can't eat and I don't want to look at them but they're there. It is like a nightmare of odd ball stuff that doesn't go together and it doesn't make any sense. I would love to sit in on one of their meetings on how these guys decide what we want to look at. I would love to tell them I am very capable of doing that myself. They do still have a Tuesday Roundup of Picked for you in the second board down in this huge general feed so you look at that first and they keep wanting to cram these pins at us. Pinterest used to be so helpful and now it is just a maniacal mess. I wanted to just look at the pins from a certain group of pinners. I think it is ingenious of Pinterest to pretend following makes any difference at all. I think they are afraid of removing following options and followers since they would really let everyone know the pins are just all their picks. So many used to really be active and now so many have left and still they don't listen. The home feed is what you see when you press the pinterest logo to the top left of the screen - it should just show people that you follow. Yes it does and promoted pins as well. They used to have it listed under where all the other feeds are awhile back maybe 3 months ago or so. Then it just disappeared and that is when I gave up. I appreciate you pointing it out but I doubt if most people will know to click the big P to the upper left. When I put my mouse over it, it just says Home not Home Feed. On my Pinterest home feed page, or whatever they call it, I see some of the pins from some of the people I'm following. I do not see any of the pins from other people I'm following. I am only notified about a very small percentage of my pins that have been "Liked", and/or "Pinned", by others. "Remove Picked For You", appears to still be functioning. I think. I've stopped paying attention. I still pin stuff on my boards, and new people continue to follow my boards every week. But I don't really care anymore. I frequently just use Pinterest nowadays to hold miscellaneous things that I might want quick access to, such as songs and how-to videos, and such.